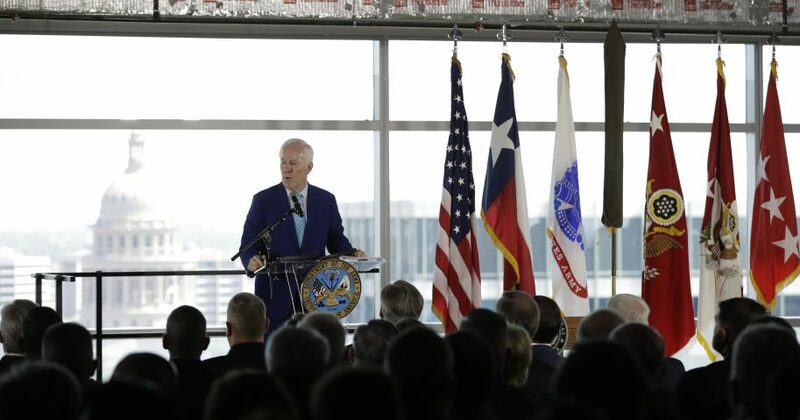 As Sen. John McCain’s family announced that the ailing veteran is stopping treatment for brain cancer, the Army paid tribute Friday at the opening of a new warfare modernization headquarters in Texas that he played a driving role in creating. “None of this would be happening without someone who’s not here today, and that’s Sen. John McCain, an American hero,” said Gen. Mark Milley, the Army’s chief of staff. McCain turns 82 next week. McCain’s condition worsened last fall and the Arizona Republican has been in his home state since December. Two members of McCain’s staff attended the ushering in of what the Army says amounts to its most significant restructuring in more than 40 years. The command is tasked with modernizing everything from combat vehicles to weapons and helping soldiers adapt to emerging threats from powers such as Chine and Russia. Milley and other Army leaders described McCain, a former Navy pilot who was held as a prisoner of war in Vietnam for more than five years, as a guiding force in making the command a reality. Discussions on establishing a Futures Command began about two years ago. “I wish he could be here. I know from talking to Gen. Milley that he was key,” said Texas Republican Sen. John Cornyn. About 500 people are expected to work at the command, most of whom will be civilians. The command for now will operate out of the University of Texas System’s new downtown headquarters that is surrounded by nearby startups and tech incubators. The Army says it wanted to tap into that workforce. Boston, Minneapolis, Philadelphia and Raleigh, North Carolina, were also on the Army’s shortlist of finalists.